All images ©DC Comics, Inc. 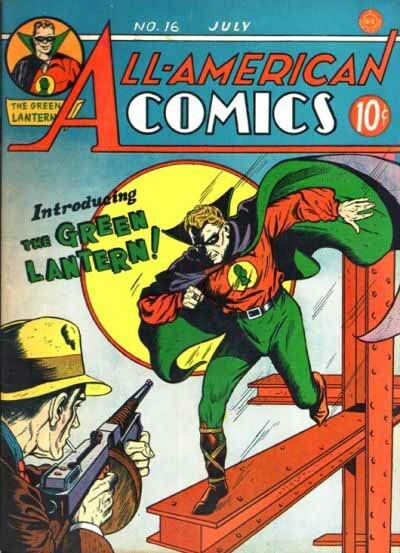 The first Green Lantern, now called the Golden Age Green Lantern, debuted in ALL-AMERICAN COMICS #16, July 1940. The cover copy has his name in open block letters, not too far in style from those used later for the character, sans-serif except for the G, which has a double slab-serif, actually, with a vertical and horizontal extensions. It could have been by cover artist Sheldon Moldoff, or someone in the company’s production department at the time. This is more cover lettering than a logo, but whoever did it tried to give it a logo feel, appropriate for introducing a new character. 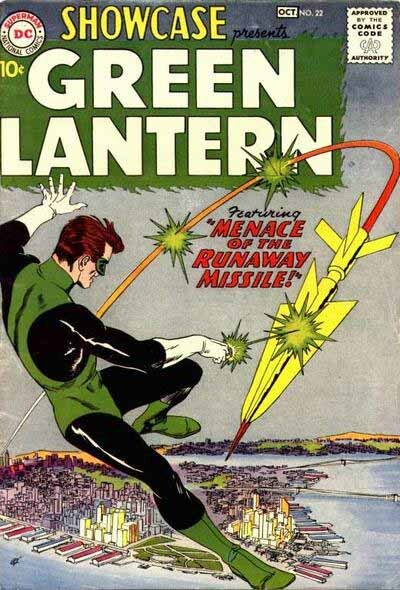 Green Lantern made fifteen appearances in ALL-AMERICAN COMICS in 1940-41 before gaining his own title, and each of those issues feature a logo on the splash page of his story. Every one is different. As often happened at the time, the artist of the story just did whatever they liked, there was no set logo. 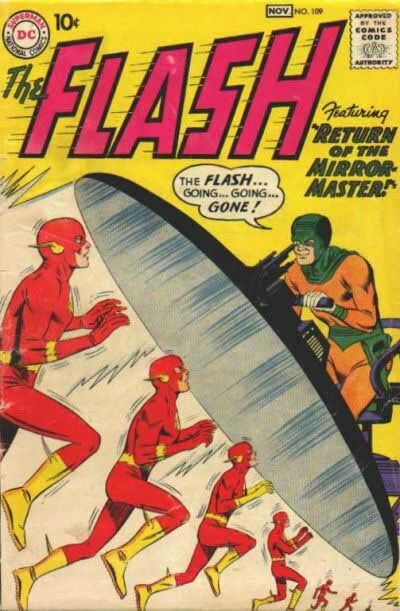 The first artist and co-creator of the character was Martin Nodell (along with writer Bill Finger), but he was signing these stories with an anagram of his name, Mart Dellon. Here’s the logo from the first story. It has elements that would often be used in Green Lantern logos: the lantern itself, a beam of green light, and block letters topped by flames. The letterforms are reasonably competent, though neither they nor the rest of the lettering on this story are well done, and the flames don’t add much, being too small and fussy for my taste. In fact, none of these early inside logos are well done. On this one the flames are larger, but seemingly out of control and almost obscuring the block letters in spots. Again, very likely by Martin Nodell. I’m just going to show a few of Nodell’s logos, but in my opinion they just go from bad to worse on these early stories. Here the flaming effect is played up, but not well drawn, and the flaming frame is really sloppy. Here’s the largest and most elaborate of them, and the letters are better, but still not well drawn. The shapes are uneven and off-model for this type of block lettering: look how thin the right leg of the last R is, and how thick the A is, for instance. The telescoping drop shadow does add some weight and solidity, and the giant lantern is nice, but perhaps over the top. 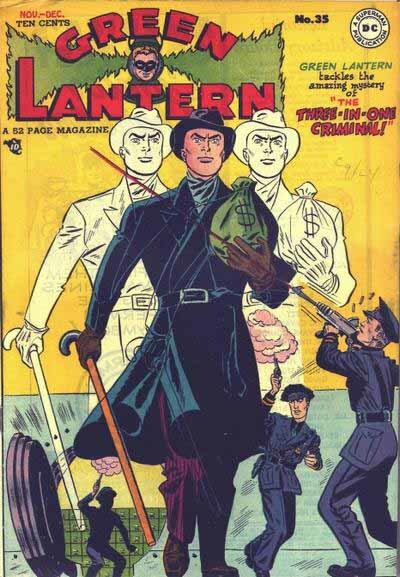 Finally, in the fall of 1941, Green Lantern got his own title and a new regular logo (which I think also appeared on all the inside stories from then on). The premiere issue of GL’s own magazine appeared in 1941 with this very elaborate logo. While some of the cover logos for the All-American division of the company that became DC Comics might have been created by Ira Schnapp, this isn’t one of them. The letterforms are too far off classic models, especially the G and R. I can’t see Ira doing that. My guess is that this logo is by Green Lantern artist and co-creator Martin Nodell. 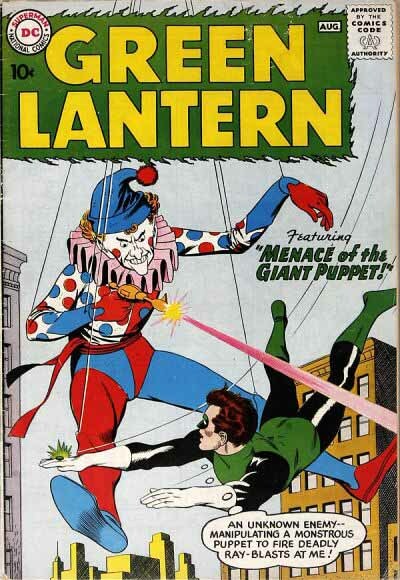 The cover artist of this first issue is Howard Purcell, but looking closely, the GL face in the lantern, and the lantern itself in the logo are subtly different from what Purcell has drawn, which I think would eliminate him as the logo designer. And the fact that this logo was also used on all the inside stories drawn by Nodell cements the idea that it was his design. The character draws his power from the green flame of this magic lantern, thus the flaming letters and outline. The flames are really overdone to my eye, too busy. All the flames lead to the left side, which looks great on the word GREEN, but I think the ones on the right side around LANTERN would have looked better leading to the right, away from the center. The letters are readable, but the flames obscure them somewhat and make that readability less than it could be. And here, for the first time of many, we see the problem of trying to fit two words opposite each other, GREEN and LANTERN into equal spaces, when LANTERN is two letters longer. The way it’s done here is to make LANTERN more condensed, with narrower letters. While it’s certainly distinctive, and represents the character and the concept well, I don’t find it very attractive overall. The next version of Green Lantern, now known as the Silver Age Green Lantern (Hal Jordan) debuted in SHOWCASE 22 in 1959. This logo, and in fact all the lettering on this cover, is clearly by Ira Schnapp, practically the sole cover logo and lettering man for DC Comics at the time, and at the peak of his abilities. The letters here are quite similar to the ones on the cover of ALL-AMERICAN 16, including the double serif on the G, but these letters show Ira’s knowledge of classic forms and art deco style. By stacking the words one atop the other, he lessens the word length problem, and helps that by spacing out the letters of GREEN a bit. The flaming green box around the letters has much more attractive and controlled flames than the golden age logos, but it begs the question, why flames? This version of Green Lantern’s powers have nothing to do with flames at all. My guess it that either the editor (Julie Schwartz, I think) suggested it as a visual tie-in to the past, or Ira simply looked back at the old logo and decided to use what elements he liked from it. The flames do add some visual interest to an otherwise very conservative logo. There the heavy outline of the letters allowed it to work against the background art, without a separating box or shape. 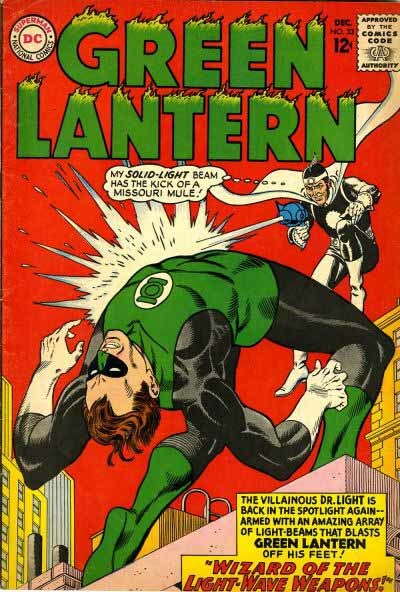 But the GL logo as created was used for some time when Green Lantern moved into his own book. It certainly caught my eye as a child, even though the name had no real explanation or meaning on the early covers. Very readable and appealing. And how about that ultra-modern outfit designed by Gil Kane? Tights never worked so well. For issue 33 a new, modified version of the logo by Ira Schapp debuted, this time with the letters more heavily outlined, to read against any background art, and with the flames now on the top of each letter. While I still find it odd that flames were used at all, I like this version even more, and to me it’s the classic and classiest Silver Age Green Lantern logo. Those flames certainly add lots of visual interest, and notice how the colorist got into them too, really making them work. Great stuff! More next time as we go all relevant with Green Lantern/Green Arrow, and the lantern symbol comes back. This entry was posted in Logo Studies on November 12, 2007 by Todd. I agree with your criticisms of the Golden Age logos. It also seems to me that in the second cover above, the perspective is off. Clearly, the intent is a one-point perspective, with the vanishing point in the middle of the lantern. But if you look at the TER in LANTERN, the tops of the letters are level and at the same height, rather than slanted. Combined with the way the letters are squeezed (the word LANTERN nearly runs off the page!) the whole thing has a distinctly amateurish look. Many thanks Todd, I’m a happy bunny – can’t wait for part two. I think I can help you with you being unable to find earlier Golden Age Green Lantern logos. 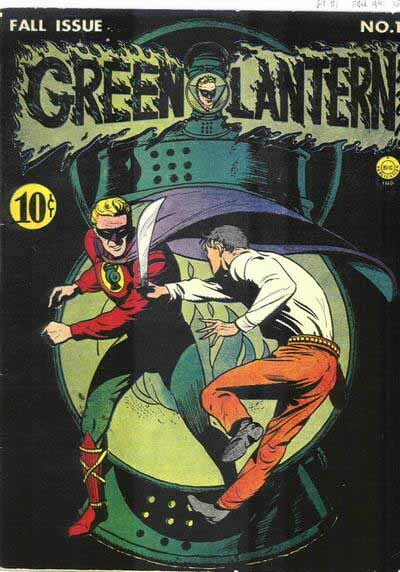 At the moment, DC Comics Archives have available two volumes on the Golden Age Green Lantern. 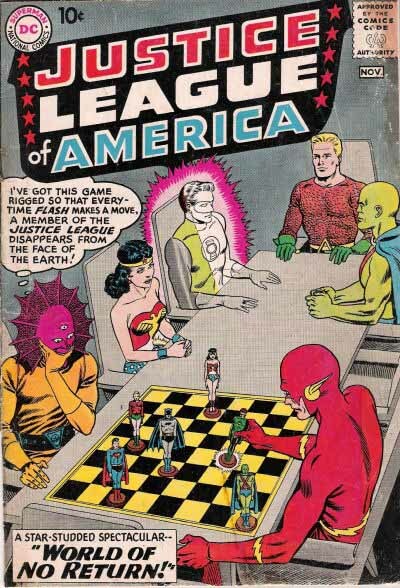 I know from experience with the Wonder Woman, All-Star Comics and Golden Age Flash volumes that they should satisfy your needs, as the logo should appear on the first page of each of the character’s stories inside the volumes. That should help you a lot. Also, I’m liking your critique of the logos. Can’t wait to read the rest. Thanks, Leoni. After I had finished the series, I realized I DID have that Golden Age Green Lantern volume which does have those early logos. They’re all pretty awful, though, each one hand-drawn on the art by Nodell. I considered doing an update or part 0, but decided to leave it alone, as I wouldn’t have anything good to say about them. You’re welcome. And I’d finished reading the rest of the series, as well as the one of your redesign of the Witchblade logo. Loved them all.